Storm sweeps through – it’s wet and wild! You are here: Home / Snapshots / Storm sweeps through – it’s wet and wild! 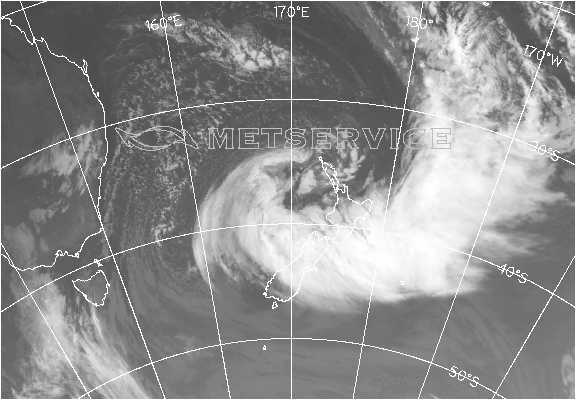 We knew it was coming our way, the storm from the Tasman that’s been brewing for days. There was nothing that really prepared us for it though. It’s wet and wild. And I mean wild. 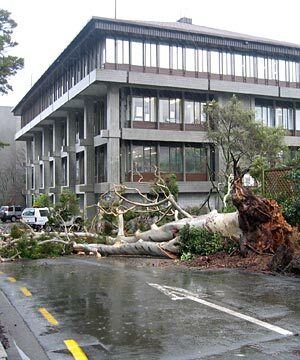 This picture shows the trees down close to the Upper Hutt Council offices. Upper Hutt is our nearest town. More trees on State Highway 2 at Te Marua (less than 1km away) have blocked the main access to Wellington and across the Rimutaka Hill. Wellington airport has been closed to some flights and judging by the water flooding my flowerbeds I can imagine that the Hutt River will be close to bursting it’s banks. The wind is whipping from a south easterly direction which makes it cold, real cold. The winds are gusty, gale force proportions leaving my poor trees battered. I can see how much they are suffering. At least on our staycation we’re warm inside and feeling real secure, if a little nervous. I can’t remember seeing such wild weather, often these storms come through the night when we’re tucked up tight in bed. I’ve ventured as far as just off the back porch dragging the bassets out to do their business. They are not best pleased as they lose control of their ears flapping in the wind. Hardly conducive to making oneself a little more comfortable! Severe weather warnings are in place with people being warned to stay at home if they don’t need to travel. Lucky for us eh we’ve stocked up and can stay at home. Here’s why you wouldn’t want to venture out. But hey, it’s not always like this. We had a beautiful day yesterday and the day before wasn’t bad. What was good about Monday was that it was clear and bright and the muck and wet from our weekend storm had evaporated to leave some blue sky. 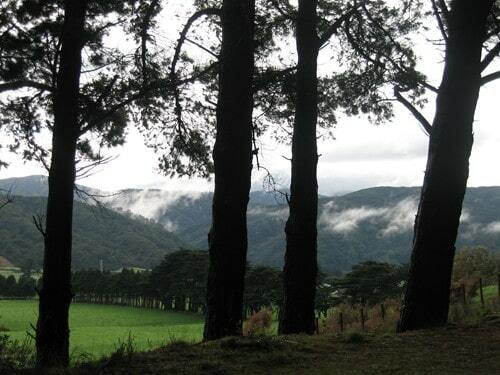 Perfect walking weather along the Rimutaka Incline track only 2km from our house. Just look at the deep colour of the green in the bush. 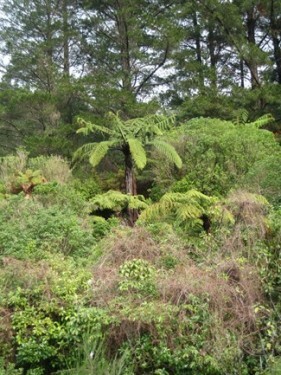 It’s just like a rain forest without the steaming temperatures! 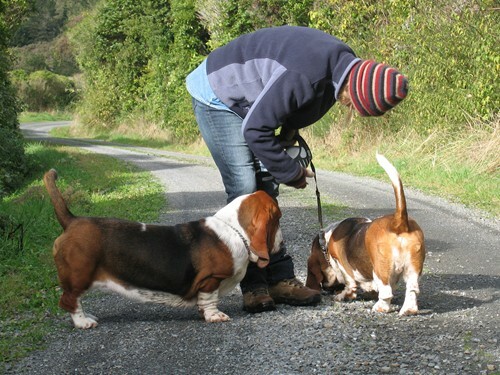 Me in a familiar pose trying to stop the bassets eating gross things! Now it’s back to business as usual – rain watching from inside! Amazing what distruction a storm can have. I’m glad things are back to business as usual, it’s so beautiful there, given half a chance I’d move out there next week. Such an amazing place.